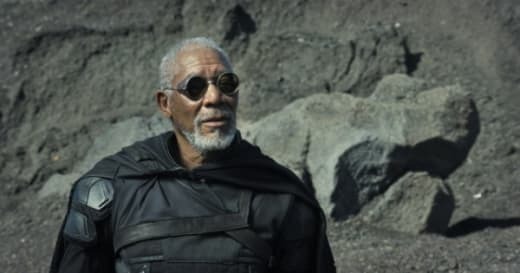 Oblivion: Morgan Freeman Says in His Future "We Would All Live in Trees"
When it came to why he joined the cast of Oblivion, Freeman answered with the two operative words that will likely drive droves to see the sci-fi thriller when it lands April 19. 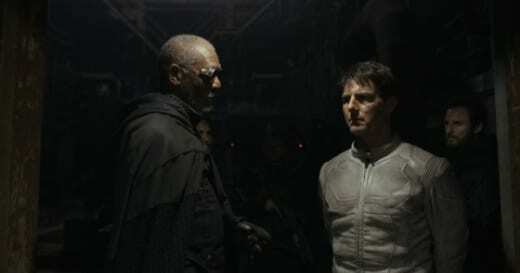 “Tom Cruise,” Freeman said. The Oscar-winning actor is visiting with Movie Fanatic on the Universal Studios backlot. We’re on what appears to be the ground floor of a Vienna opera house, which is utterly terrific considering the completely opposite world of sci-fi being discussed for Oblivion. As teased in the Oblivion trailer, the film is such a mind-bender (our review premieres opening day), Freeman was eager to dive in to the latest Cruise vehicle. “It’s a Tom Cruise movie -- if I was going to be a truck driver hauling supplies (for this film), I would have taken the job. I’m one of his huge fans. I have been one for I don’t know how many years -- way, way, way back,” Freeman said. We wondered if two people, who first met at the 1990 Academy Awards, wanted to work together for so long, what took so long? “When we say we want to work together and we’re looking for something to do, that’s not an active thing. If that was the case I would have been in Mission Impossible. But when the right project comes along, it’s sort of a domino effect. Everything falls into place,” Freeman said. “This was the perfect genre for me to be involved in with Tom, so I no longer resent having not done anything with him before,” he said, laughing. 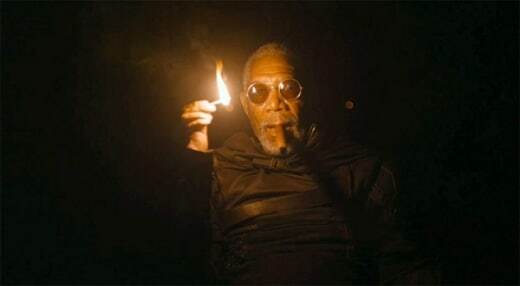 Freeman, like most audiences, initially discovered Cruise when he slid across his parents’ floor, belting out Bob Seger. “The first time I saw him was in Risky Business. When his (character’s) parents walked out of the house and he slid into frame in his Jockeys and did that whole (dance) thing, I thought, 'This kid is awesome!'" Freeman said. There’s also some incredible sci-fi wizardry from director Joseph Kosinski and his story of Cruise’s Jack and his only people left on Earth partner Victoria (Andrea Riseborough). They are there after the planet was invaded by aliens. And although humans won the war, the planet was left a wasteland as the race had to evacuate to an orbiting space station. Jack and Victoria are on a tour of duty supervising the extraction of Earth’s remaining resources. But… are they alone? Freeman’s mystery man meets Cruise and the whole drama catches fire. “It’s very intelligent and extremely creative,” Freeman said.